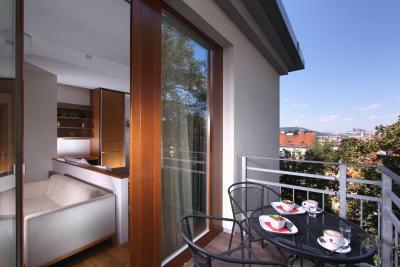 Lock in a great price for Rezidence Vyšehrad – rated 9.1 by recent guests! 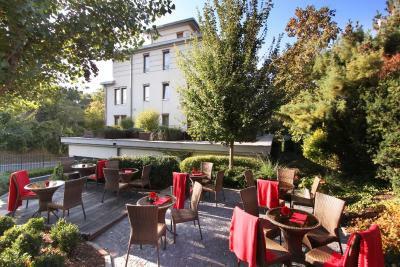 Lovely hotel, with accommodating staff and amazing location. I loved how close it was to the city. I also loved that they had a parking garage to park in. The place was a good size. 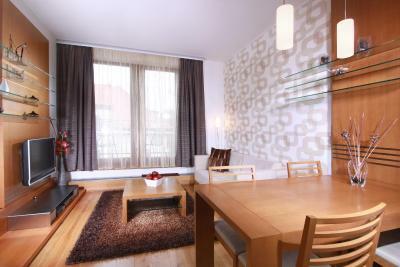 King size bed with room for small sofa, a small dining table with a small kitchenette. They even placed a small crib/ toddler bed and we still had some room. We were very pleased with the whole room over all. We also liked that there was a train station close by which made it very easy to move around the city. We did drive and left our car in their parking garage the whole time we were there. Our breakfast was also included and it was not bad at all. Typical European breakfast with breads, jams, and meats along with many other options. It was very good! Overall we were very satisfied with everything the hotel had to offer. We will be coming back again when we return this summer. Staff very friendly, service is very good. Just 2 minutes walking from a very famous landmark of vyshrad. 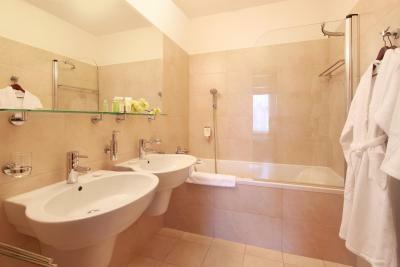 Location is quiet, convenient to the metro. Beds are comfortable. Liked that there was a half bath in addition to the full bath. Solid breakfast. Everything was perfect! 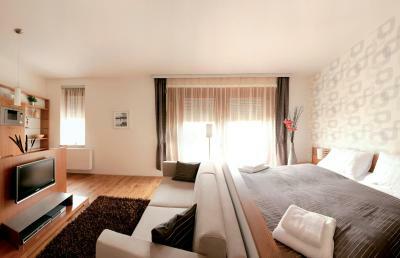 Room was large with nice balcony and comfortable bed. Shower was hot with good pressure. 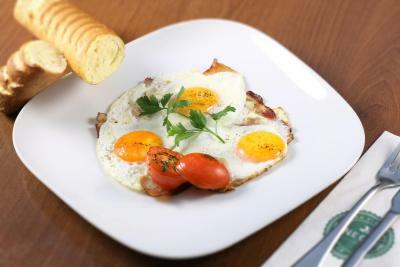 Breakfast was great with eggs cooked to order, cheese and meats, fruits, juices, salad, etc & espresso coffee drink of your choice. Staff was excellent! Yanna at the front desk was very kind and helpful. Didn’t have a chance to try the sauna or fitness, but appreciated that it was open 24hrs! 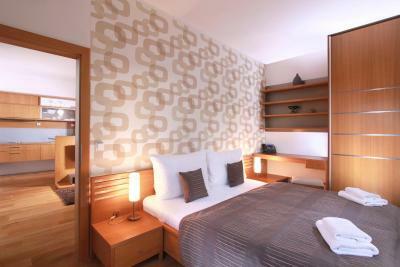 The hotel is very nice and the rooms have everything that you need. The staff is nice and helpful. Breakfast is very good but they have the same everyday. You can ask for some stuff from the kitchen like eggs, boil or omelet and a cappuccino. 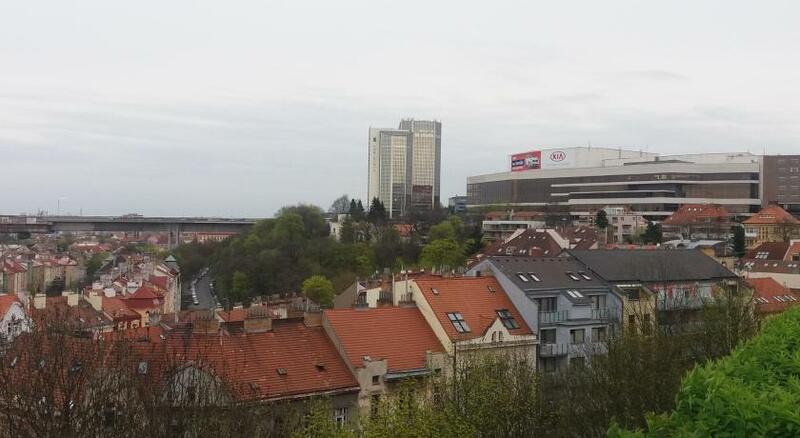 The hotel is not in the center but the metro is very close by and easy to get places. Just across is there a historic fort from the 10th century, a place to see. The location, staff, facility, cafe and everything was, PERFECT!!! This will be our residence in the future, every time. 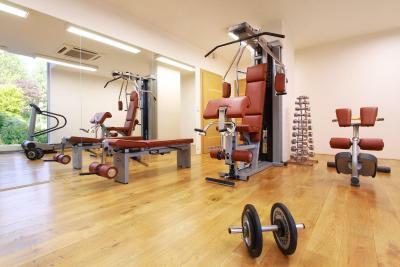 Clean, friendly, accommodating and incredibly helpful. 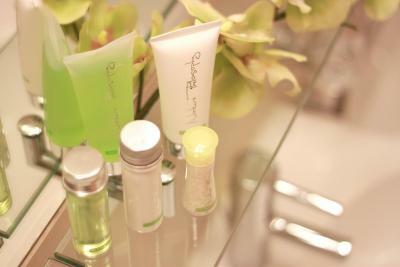 Everything was great, clean rooms, very friendly staff, breakfast was very nice and a balcony outside was great. 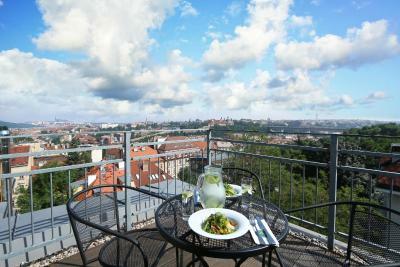 The location was superb -- Vysehrad is a tranquil, green, historic gem and was a highlight of our trip. 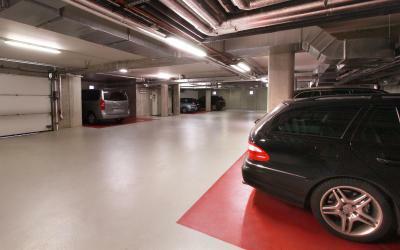 The Metro stop is very close and in two quick stops you are in the heart of the city. 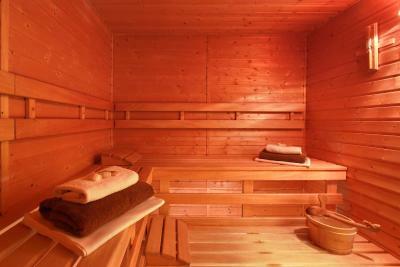 The beds are very comfy, the breakfast is excellent and the free sauna was a treat. Loved having a balcony with a cafe table (lovely views and chirping birds), a tub/shower combo, full-sized refrigerator and microwave and room to store our things. The staff was friendly and very helpful. Would definitely stay here again. 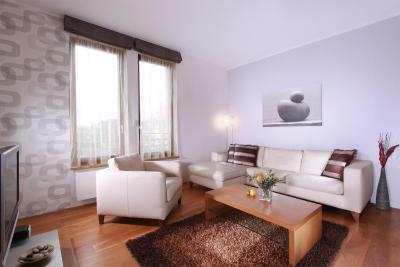 Rezidence Vyšehrad This rating is a reflection of how the property compares to the industry standard when it comes to price, facilities and services available. It's based on a self-evaluation by the property. Use this rating to help choose your stay! 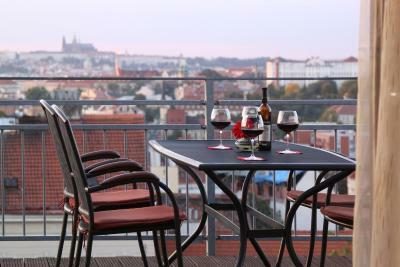 One of our top picks in Prague.The Rezidence Vyšehrad has suites with kitchenettes and balconies at the foot of the Vyšehrad hill, garage parking for a fee, free Wi-Fi and free wellness and fitness facilities. 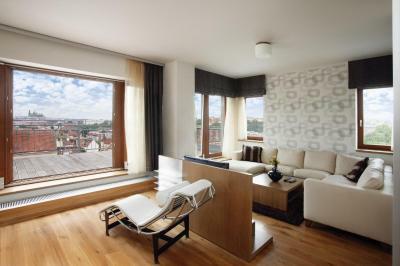 Overlooking the city, the spacious and air-conditioned suites are furnished with hardwood floors and they include satellite LCD TV and DVD players. 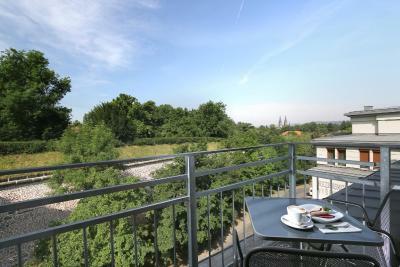 Rezidence Vyšehrad is located across from the Congress Centre, a short walk from the metro station (line C). There is a special Thai massage room on site. The restaurant at the Rezidence features a charming terrace and serves Italian cuisine including homemade pasta and freshly-brewed coffee. 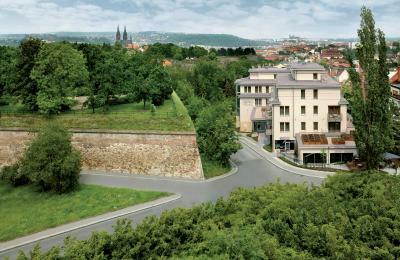 When would you like to stay at Rezidence Vyšehrad? 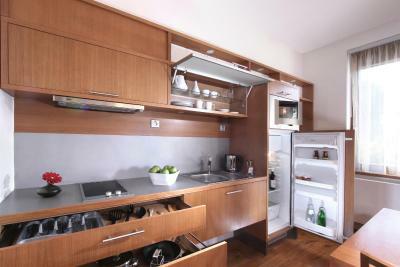 This air-conditioned suite has a combined living and sleeping area with a kitchenette. 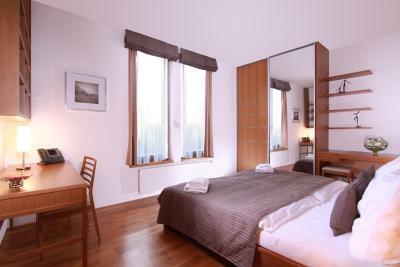 Please note that extra beds are available only in some rooms of this room type. 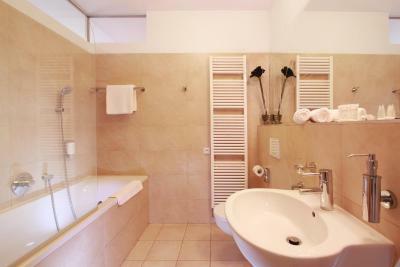 Spacious air-conditioned suite with a living room, a bedroom and an kitchenette. Some suites come with a balcony. Mostly with views of Prague, this huge air-conditioned apartments features a separate bedroom, a living room, a terrace or balcony and a fully equipped kitchen. 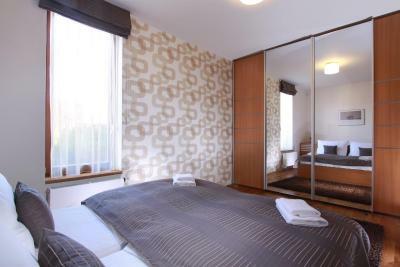 This spacious air-conditioned suite features a balcony and a bathroom fitted with a shower. House Rules Rezidence Vyšehrad takes special requests – add in the next step! Rezidence Vyšehrad accepts these cards and reserves the right to temporarily hold an amount prior to arrival. Nice place but last evening completely ruined by a family that were staying in the room opposite- they had two for gs that constantly barked for hours whilst they went out and left them- completely irresponsible. I complained to the hotel st the time and they contacted the family who eventually returned after several hours of barking. Also woke me during the night and early in the morning with more barking!!! I asked when I checked out whether I would be compensated iby a reduction in my final bill due to the inconvenience that I had been caused and was told that there were no management on duty that could make any decision regarding a refund but no management were working as it was a bank holiday- this is not acceptable and I should have received a discount to reflect the significant noise and inconvenience that I endured- thus has put me off returning and I feel that a manager should have been available fir staff to contact on a Bank Holiday. 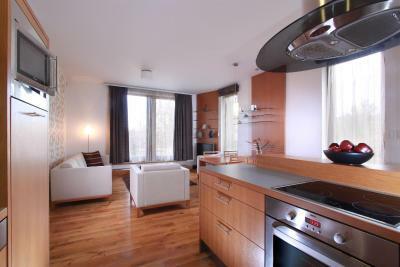 Really like the apartment, it has a small kitchen with all cooking facilities, fridge and microwave. There’s a big terrace with good view as well. It really makes me feel at home. The breakfast was nice. Although it’s not in city center, but the tram and metro give us easy access to go to city. The area is quite and safe. Will definitely book again next time we come to Prague. Everything exceeded my expectations. Amazing breakfast and short walk to metro. Quiet and beautiful neighborhood! I expected a bit more modern apartment for such price. 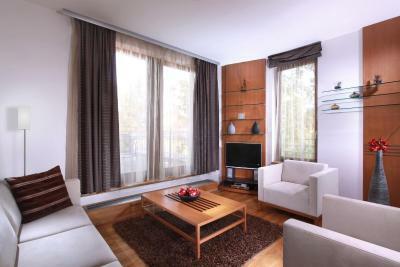 Location is very good, next to Prague Conference Centre and not far away from OldTown and Central Station. The TV channels should include more English language ones, it was mostly news for English. There was some loud noise we could hear every morning that seemed like ongoing construction. The bed was so comfortable. 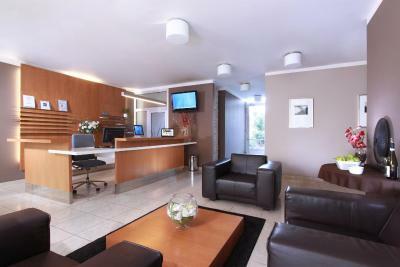 The guy receptionist when we first came was very polite and helpful. Staff were very friendly & helpful. My room was brilliant and very comfortable. Good value for money in a convenient location. TV cannot be seen or watched from bed, because of the semi wall that separates sofa and bed. That's same situation in all rooms and its quite annoying. 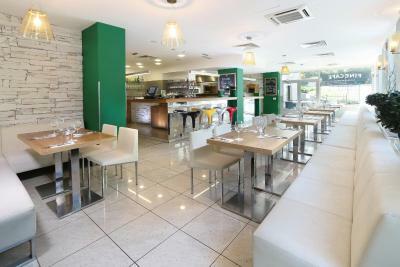 The hotel restaurant was under reconstruction and we were told THE DAY of our arrival, so we couldnt really cancel. That was probably the biggest dissapointment. We arrived and were told, that the sounds are not as bad as it seems, but that was far away from truth. Sound of a drill woke us up every day at 9am along with smashing hammer. I understand, that mostly their guests might be awake that time, but we were looking for some peace and quiet hotel where we can finally rest. Saddly, that was possible only at night. Location of the hotel was very good and one of the ladies on the reception was really nice. I would like to thank for the champagne that we got from hotel as an apology, but saddly it was far away from enough. Maybe a bigger variety for breakfast. The location is really close to the subway(aprox. 4 min walking). Room had a nice view and was clean. Staff was friendly and help us with info how to the to the metro and downtown(including providing a map). The hot water in the shower wasn’t steady. Restaurant! 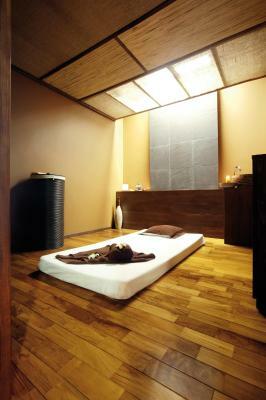 Massage and spa room. The bed wasn’t very comfortable and the property sits on a hill, therefore winter stays wouldn’t be the best.